Fatah fighters opened fire on Hamas supporters in Ramallah leaving at least 30 injured, including a 10-year-old boy. 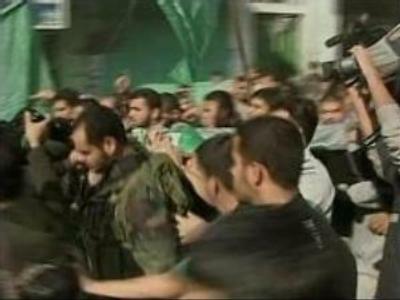 It followed an attack on the Palestinian Prime Minister Ismail Haniyeh's motorcade. As a result, one of the Palestinian Prime Minister’s bodyguards was killed. Meanwhile, large numbers of Hamas supporters gathered in Gaza City for a rally to hear Ismael Haniyeh giving an address. He has returned to Gaza without the millions of dollars which he raised in Iran. On Thursday, Mr Haniyeh was blocked by Israel from crossing the border with money donated by Middle Eastern states. In response Hamas militants stormed a security terminal and exchanged gunfire with the Palestinian presidential guard in Gaza. The Prime Minister's son was one of dozens injured. Speaking after his return, Ismail Haniyeh said that these events will only make the Palestinians stronger. “These occupiers do not know Palestinian mentality – this will only make us more steadfast in the face of occupation and humiliating practices we are subjected to,” Mr Haniyeh stated.